WHY DO YOU TRY TO DO ALL YOU CAN TO SAVE NATURAL TEETH – WHY CAN’T I JUST GET A DENTURE? While one-third of the people in the US over 65 wear dentures, and many of these people are not happy with them. Dentures are large plastic pieces put in the mouth; they change the way people chew, the way food feels, and the foods that can be eaten. Many people cannot wear dentures successfully, especially lower dentures. Once teeth are gone, there’s no going back. It’s too late to get your teeth back if you can’t wear a denture well! Why do people need dentures? When a patient has severe gum disease or tooth decay, their teeth are not fixable. Dentures are often recommended when it becomes extremely costly to fix a patient’s teeth, usually due to neglect. In this case, dentures are the only affordable option. Ongoing treatment and preventive dentistry are critical so you may never need to wear a denture at all. Are upper or lower dentures more of a problem to wear? Note the pictures above: See how the upper denture (on the right) covers the palate (the top of the mouth)? 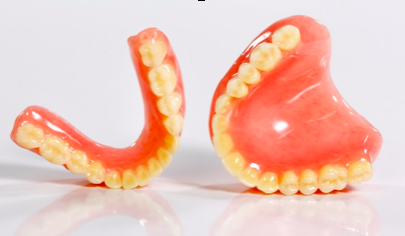 This arrangement gives extra support and suction to a denture, so upper dentures are usually easier to wear than lower dentures (on the left). However, an upper denture is still a large piece of plastic in the mouth; food tastes and feels different and food can be harder to eat with a denture than with natural teeth. Why are lower dentures such a problem to wear? The lower denture (on the left above) is much smaller; the tongue is in the way and the denture must hold on to the small horseshoe shaped ridge that remains. Rarely are patients happy with a lower denture. We dentists have an expression, “Most lower dentures are worn in the back pocket.” If you can keep even some of your lower teeth, rather than wear a denture, life will surely be better for you! If I need a lower denture, can I do anything to make it fit better? Implants (small titanium posts implanted in the jaw) can help dentures fit better. A denture can attach to the implant and be more stable. Also, if some teeth are savable, implants can be used to anchor a denture and it will fit better than a denture by itself. My neighbor wears his denture well. Why can’t I? Most people will not honestly tell you what they tell us about their dentures. Even some husbands and wives won’t tell each other about the troubles they encounter with dentures. It’s just too private and embarrassing to admit not being able to wear a denture. However, dentists hear about denture problems all the time! Will I have to go without my teeth while my denture is made? No, we can do what is called an “immediate denture.” The immediate denture is made before extractions are done (teeth are removed). An oral surgeon places the immediate denture on the day the teeth are extracted. However, since this denture is a ‘guess’ as to how the gums will heal, a final denture will have to be made once the gums heal – usually 60 to 90 days after the extractions are done. What if I have no other choice than to wear dentures? If dentures are the only option, have them made by a reputable dentist who takes the time to do them right; this usually means multiple appointments. To make dentures well, the dentist’s technique and use of a good lab are especially critical. This is why well-made dentures are costlier. I see ads for $300 or ‘same day’ dentures. Why do your dentures take longer and cost more? There are some ‘one day’ denture services or dentists who do dentures very cheaply. You get what you pay for. I spend a lot of time redoing poorly made dentures made cheaply. Have your denture done by a reputable, experienced dentist the first time so you don’t waste money on dentures that are haphazardly made and not likely to fit. If I have to wear dentures, how can I best maintain them? It is best to remove dentures at night to let your gums ‘breathe’. Anytime a denture is not in your mouth, it should be in a commercial denture soak product. Have yearly dental exams; an oral cancer screening is done in a yearly exam to make sure you show no signs of oral cancer or any other illness condition in your mouth. What is a reline and why might I need one? Your gums recede at least 1/16 of an inch each year. This means that the denture is no longer made for the current condition of the mouth. Dentures sometimes move, and a moving denture causes sore spots, makes it harder to chew, and can be embarrassing if the denture flies out while the person is talking. A reline puts a new hard acrylic liner (done in the laboratory) into an existing denture. A reline can make the denture conform to the current state of the mouth. This will make the denture fit better. The American Dental Association recommends replacing dentures at least every five years. In that time, the mouth has changed shape drastically and old dentures won’t fit well, which can cause problems. Also, by that time, bacteria have invaded the denture material making them unhealthy to wear longer.